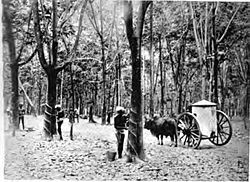 The rubber estates of Malaya would not have been a success story if not for the South Indian labour force brought in by the British from the 19th century. Vishwalingam and his cousin Raju were second generation rubber tappers, their fathers having started the family move to Malaya from Madras. The East India Company fleet not only traded in valuable spices from the Far East, but with the establishment of the rubber plantations, manual labour was transported over as well. David loved Malaya. He was home schooled by his mother and never went to England for his studies, unlike his brother Henry. His knowledge of the people and the land was acquired from his Malayan upbringing and hands on experience in the estate. David loved his nanny. Osman Baharom, the Malay houseboy was employed to clean, cook and look after the boys when they were young. He was David's only true companion all those long months when mother, father and Henry were abroad for months on end. He always thought it odd that his name was David Bradwall, when he felt more like a Daud Baharom. As he grew older he found his feelings change from brotherly to not so brotherly any more. It developed overnight, almost, when he overhead his mother telling his father that Osman was getting married. His family had found him a wife in the village, a padi farmers daughter. That would mean he would have to work on his father-in-laws land. This news troubled David and kept him awake for nights aching for some form of physical consolation from his soon-to-be-lost companion and friend. David was given the task of managing the labourers of the estate. The Indian labour line quarters, at the edge of the estate, were complete with housing, a Tamil language school and a dispensary for minor ailments. His monthly inspection visits exposed him to the rubber tappers and their way of life. Young men like Vishwalingam and Raju had never set foot in their homeland, just as he had not, and could only rely on stories from their father and co-workers on the estate to learn about Tamil Nadu. The women folk kept the food and cultural traditions strong in the community. One visit, he was passing the quarters towards the school. It was 7 in the morning. All the adults should be out tapping. They only get back by 10 before it is too hot, then out again at 3 to 7 before dark. He heard heavy breathing and movement as if two people were struggling. He peeped through the louvres of the window and saw two glistening bodies wrestling on the floor. The rattan mat beneath them was awry and wrinkled, and yet this continual wrangling of bodies persisted. He caught the side of a face. It was Vishwalingam. The other boy, was pinned down and had submitted. David silently crept away. The visual kept playing and replaying in his head, excited and aroused as he found he savoured the experience. He called Vishwalingam to his office the next week. "Vishwa, I want you to learn some clerical work. I need help in the office. You will be my assistant. You start tomorrow." Vishwa visibly confused and thrown by this order asked "Sir may I ask why? I have brought in my share of latex everyday, have I not, Sir?" "No, no it's nothing like that. You are one of the few who can read and write, and your English is not bad. So I have chosen you to help me in the office, that's all. You start tomorrow." Vishwa turned and walked away, but David only saw the sweaty glistening tight back. Errr...I anticipated romance but whoa! this caught me by surprise! David, oh, David! Great story, if a bit of a disturbing ending. :) Those were the days, wasn't it? My father still recounts them, how Chinese and Malays lived together. He still has a Malay friend who grew up with him. The guy speaks fluent Cantonese and who married a Chinese. Eww! Nasty. I'm glad you stopped there. No-one should have power over another anyway.